I would wager that most people have never encountered a crusta, or even heard of one. So what is that thing? And why should we care? The crusta is one of the many early embellishments of the original cocktail, the spirits-water-sugar-bitters one we think of now as the Old-Fashioned. Bartenders have always been an imaginative bunch, on the lookout for something new to sell, and the middle of the nineteenth century was a time of experimentation and the development of what were known at the time as “fancy” or “improved” cocktails. The crusta, specifically the Brandy Crusta, is the forerunner of the modern Sidecar. And of the Margarita. And the Cosmopolitan. But it’s quite a leap from the crusta prototype to those more familiar cocktails. The ingredients are all there, but the proportions are nearly unrecognizable: in the crusta, there’s only a hint of citrus, and just a touch of sweetener, with both measured in mere dashes. None of this 2:1:1 proportion we see in the modern sour. The crusta amounts to a glass of spirits with a a tiny amount of flavorings—and a remarkable garnish. Jerry Thomas was the first to publish the formula, but cocktail historians suggest that he almost certainly picked it up from New Orleans bartender Joseph Santini sometime in the 1850s. It’s interesting to speculate about whether we would be talking about it now if Thomas hadn’t found it interesting enough to include in How to Mix Drinks . That dash of citrus is probably Santini’s most important and long-lasting contribution to cocktailing, but the real hallmarks of the crusta have as much to do with presentation as with ingredients. For starters, Santini’s Crusta was served in a stemmed wineglass with a sugared rim, instead of the usual, plain bar glass. Stemmed glassware and sugar rims weren’t new, of course; they were already part of the “fancy cocktail” repertoire, but not in the main stream. The special touch was the drink’s singular, ostentatious garnish: the peeled shell of half a lemon that serves as a liner for the glass. 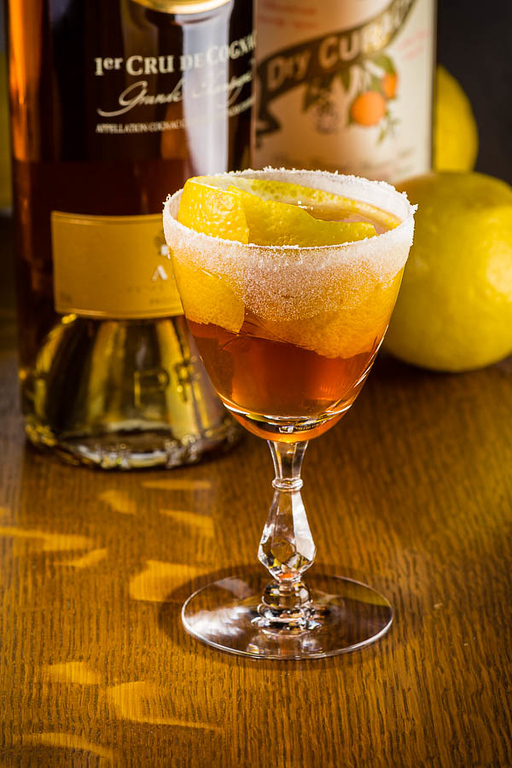 The combination—a dash of lemon in the drink, offset by a liqueur sweetener, a lemon shell, and a sugared, fancy glass to wrap it all up—this was something new. This was Santini’s Brandy Crusta. Wet the rim of a small wineglass with a lemon wedge and coat the outer rim with superfine sugar. Line the glass with the thin-pared peel of half a lemon, peeled in a single, wide strip. Stir ingredients with ice until well chilled, then strain into the lemon-lined serving glass. As I noted earlier, the Brandy Crusta is essentially a glass of brandy with some flavorings in it, so definitely use a decent brandy or Cognac. I enjoy the Ferrand 1840 in the Crusta, but any good VSOP brandy should do just fine. As for the Curaçao, Grand Marnier and Ferrand Dry Curaçao are both Cognac-based liqueurs, and blend very nicely with the brandy base. The original mid-nineteenth century recipe called for Boker’s bitters. Boker’s went out of business during Prohibition, though there is a product on the market now that purports to be a recreation of the original recipe. I look forward to trying that some day, but meanwhile I make the same substitution Harry Craddock made in the Savoy Cocktail Book in 1930: Angostura. Of course, a quintessentially experimental cocktail like the crusta is fair game for bitters experiments—my favorite experiment so far is Bittercube Bolivar. The lemon peel garnish is the hallmark of the Crusta. 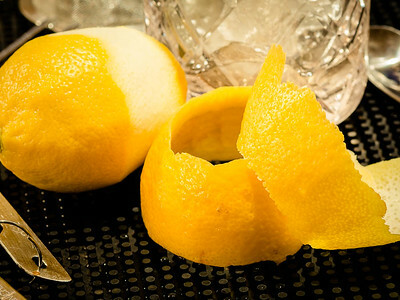 You want to make as wide a peel as you can, one that will be strong enough to sit up above the rim of the glass.The usual way to do this is to cut off the tip of the lemon; then, starting in the middle, peel a wide, continuous strip around the fruit, progressing to the end of the lemon to completely remove half of the peel. You need to use a relatively straight-sided serving glass, not too big around, to support at least some of the peel above the sugared rim. How’s it taste? The nose is all about that brandy, and just a hint of lemon—that peel extending above the rim of the glass is as much a treat for the nose as for the eyes. The flavor, too is driven by the brandy, with just the smallest hints of brightness from the small amount of lemon juice. The added sweetness of the sugar and liqueur and the hint of orange from the curaçao help to round the edges of the brandy. The swallow lingers first with the brandy, then with a lasting bright lemon note. As the drink ages in the glass, it takes on more of the flavors of the lemon peel and lemon oils. So why did the Brandy Crusta disappear? According to David Wondrich, writing in his 2007 Imbibe!, the crusta was always something of a cult cocktail, “one with few but fanatic devotés.” I’d love to know more about its early popularity, but I’ll take his word on it. It seems to have been just popular enough that bartenders in general, notably Jerry Thomas, felt they needed to take notice of the category, and so it survived all the way to Prohibition. It’s not hard to see how Prohibition made for a tough environment for the poor old crusta—it’s a bit finicky for the speakeasy crowd. By the time Repeal rolled around, it was more a curiosity than anything else. In the long run, I suspect its characteristic of standing in the middle between the very popular Old-Fashioned and the very popular Sour was its undoing. It was, as they say, neither fish nor fowl; that ambiguity, combined with its labor-intensive presentation, kept it out of the mainstream. As a result, the Brandy Crusta is more of an honored ancestor than a living cocktail. It’s too bad, because it is a tasty, and flashy, variant of the Old-Fashioned, and well worth having in the repertoire. Give it a try, and let me know what you think. “An Old-Fashioned the hard way: the Brandy Crusta” at cold-glass.com : All text and photos © 2015 Douglas M. Ford. All rights reserved. Thanks for the reminder of this great cocktail – and for its history which I didn’t know. Actually this was the first cocktail I ever encountered – 45-50 years ago as a youngster in New Zealand – and for many years it was the only cocktail I drank – until I acquired a taste for the classics! I’d forgotten about it, so time for a reacquaintance. Interesting story, Philip, I’m guessing not many people can claim the Brandy Crusta as their first cocktail. I’d love to know the story of how that came to be, as opposed to less obscure, more predictable firsts like, say, the Martini or Margarita. Thank you for sharing that; I hope you still enjoy your crusta after all these years. The Crusta seems to be a brilliant example of cocktail relics. This, let me say, “dashing” works exceptionally well for many ancient creations. One of my last touch of that kind of cocktails was Improved Whiskey Cocktail and it was great experience! I thought “dashing” worked in a very subtle and interesting way here. It isn’t something I’ve tried before, at least not with something like lemon juice, and I look forward to trying it on other cocktails. Thanks! I agree that only a dash of lemon juice really can highlight a cocktail. It also works very well in the Holland House cocktail. Thanks for an interesting history lesson. You’re welcome; I’ve been surprised and delighted to learn that a lot of people seem to enjoy Brandy Crustas, who knew? Lovely pictures of a Crusta. I also did an article on sugar and salt rims, where the Brandy Crusta featured prominently as an extreme example of a cocktail glass rim; but my pictures are not nearly as stylish as yours. Nice article. I’m considering batching a version of this (minus the citrus) and adding it to our drinks menu. I might actually be able to make it work, even on a busy night if everything is prepared ahead of time. Both Grand Marnier and Dry Curaçao are actually orange-flavored brandies. Try using a true Curaçao liqueur such as Cointreau or Luxardo Triplum. I’ve never seen crustas on a bar menu, that would be an impressive stunt if you can pull it off. I hope that works! Brilliant article Doug! Absolutely love how in-depth you have gone with the history of the crusta – perfect supplementary info to share alongside my cocktail video & recipe I’ve just posted! Cheers & keep up the great work! Thank you, Steve. I’m glad you enjoy the history, it’s part of what makes cocktails fun for me. Hi, sorry about the time lapse. I ran into your interesting piece just now, since i, although being a, to my mind, rather sophisticated home bar cocktail maker, only yesterday came across the Crusta for the first time, in Belle Epoque, a local cocktail joint (in Malmö, Sweden), which drove me right into Google-land. I went first to Simon Difford, my usual guru, and he had it, of course, but the ingredients for the Crusta listed in the bar menu included absinth, which were missing from Simon’s recipe. I have yet to find a Crusta recipe with absinth. What do you think about this? Absinthe is an interesting flourish for a crusta, and one that I’ve never encountered. I’m imagining that it would taste rather like a lightly soured Sazerac. My preference would be to omit the absinthe, but Belle Epoque’s version clearly caught your attention. I’m glad you found Cold Glass, thanks!